Got a classic car to sell? We can Sell it! Call us Today! 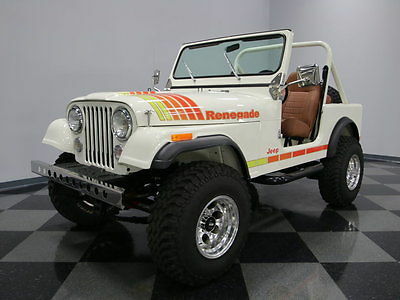 Great pristine white bodywork with a touch of chrome and an enhanced 304 V8 means this 1981 Jeep CJ7 is a 4x4 with flash AND substance.The shining white paint with Renegade graphics is a look we can't get enough of in our showroom. The whole appearance is like a desert sunset, and so this CJ7 feels like it's itching for an adventure even when parked downtown. And that's really the point of owning a classic like this. You can take it to the beach or in the backwoods, but for those times with its just part of the grocery run, the rest of us in the parking lot are wondering what journey you'll be off to next. This is still an American classic, and so there's plenty of room for attractive chrome on the front bumper, mirrors, and 15-inch Pacer wheels. This Jeep has both a fresh and adventitious appearance with features like the newer fender flairs and Smittybilt tubular side steps. Possibly the best piece is the full-size spare mounted on the swing away rear hinge. It's essential for the times when you're miles from civilization, but in the city, this is great rear end jewelry.Since a Jeep should always be open to the world, you'll love how the exterior and interior seamlessly blend. The same updated glossy white paint is seen everywhere from the floorboards to the dash. Plus, the caramel vinyl interior matches perfectly with the earthy tones of the exterior graphics package. While the bucket seats are covered in a nearly bulletproof vinyl, they are comfortable enough to make the trail an easy ride. The controls are laid out in typical Jeep fashion, with a grippy three-spoke steering wheel, long-throw shifter for the three-speed manual, and a shorter stalk for the four-wheel drive. All your essential elements, including heat/defrost and gauges are clustered in the center of the dash. The AM/FM/cassette stereo with auxiliary hookup has analogue controls for the period-correct feeling while providing upgraded audio.Unlatch the hood and you'll find a 304 cubic-inch AMC V8. The overall tidy presentation and white engine bay makes the whole setup look like it has never seen a muddy day. And if you dig deeper, you can see some performance enhancements, too. It includes a Holley four-barrel carburetor and Edelbrock Performer intake. On the road, this total package gives you an extra wallop of power that you can control with the three-speed manual transmission, and it has the kind of rumble out of the dual exhaust that will get you respect from muscle cars. On the trail, this enhanced V8 is a great partner with the sturdy 4x4 components like the two-speed transfer case and Pro Comp ES3000 shocks. Add in power steering, front disc brakes, and the grip of BF Goodrich Mud-Terrain tires, and this is truly an unbeatable package.To understand the level of care that has gone into this Jeep, just look at the undercarriage. Now you see that the clean and pristine appearance is everywhere on this 4x4, and that's what makes it a truly superior package. So at this price, you know you have to hurry to take it home. Call today!!! Vehicle may be sold by Streetside Classic Cars prior to the end of the auction. Streetside Classic Cars reserves the right to end its auctions early or to cancel bids solely at its discretion and shall not be held liable for any such cancellation. The winning bidder is required to contact Streetside Classic Cars within 24 hours after the close of the auction to finalize the details of the transaction. A $500 Paypal deposit is required immediately upon selecting the Buy-It-Now option. The $500 Paypal deposit is non-refundable as ending an eBay auction and not buying the vehicle is very damaging to the seller. Any refunds will be at the sole discretion of Streetside Classic Cars and are not guaranteed. If winning bidder does not contact Streetside Classic Cars and submit deposit within 48 hours of auction close, vehicle may be made available to the next highest bidder or another qualified buyer on a first come, first serve basis. Streetside Classic Cars has represented this vehicle to the best of its ability. Prospective bidders are encouraged to contact us directly to provide additional information or answer any questions. Please be aware that all pre-owned vehicles, regardless of age, mileage, or manufacturer are subject to cosmetic wear and mechanical failure. Streetside Classic Cars encourages bidder to have a personal inspection completed prior to delivery to help ensure your satisfaction. Third party inspections are to take place prior to a vehicles shipment or delivery. Streetside Classic Cars bears no liability and shall be held harmless for any complications, expenses, or damages resulting from a failure to meet these terms as they have been set forth and established herein. Rest assured, you are dealing with one of the largest classic car dealerships in the United States with one of the largest (500+) vehicles on display. Our sales staff is very knowledgeable and can assist you in every aspect of the purchase. If you decide to purchase from us, we require that you give us your complete name, address and phone numbers (home, office, mobile and fax) and a port of entry that handles containers. We do not ship vehicles open (RORO: Roll On Roll Off) due to risk of damage to vehicle and theft of parts. All international purchases must be paid by bank wire transfer in US Dollar funds only. Once we have received the funds, we will prepare the car for international shipment through one of our approved land and ocean carriers. We file all the necessary documents for export, deliver the car to a US port, secure it in containers and board an ocean carrier. We can land a vehicle to any port worldwide handling container traffic. We export cars regularly and are familiar with export requirements. You, or your agent, are responsible for Custom clearing the vehicle and registration in your own country.